If you like home renovation projects and interior design, you should make yourself a note to visit The Old Painted Cottage on Monday, August 24, 2009. Jennifer is going to reveal the cottage that she and her husband have been renovating since last year. This is their very first home and they have been working really hard to make it exactly what they want. I’m really curious (I’m just nosey like that.) Aren’t you? If so, just click on the link and visit her blog and find out what it’s all about! 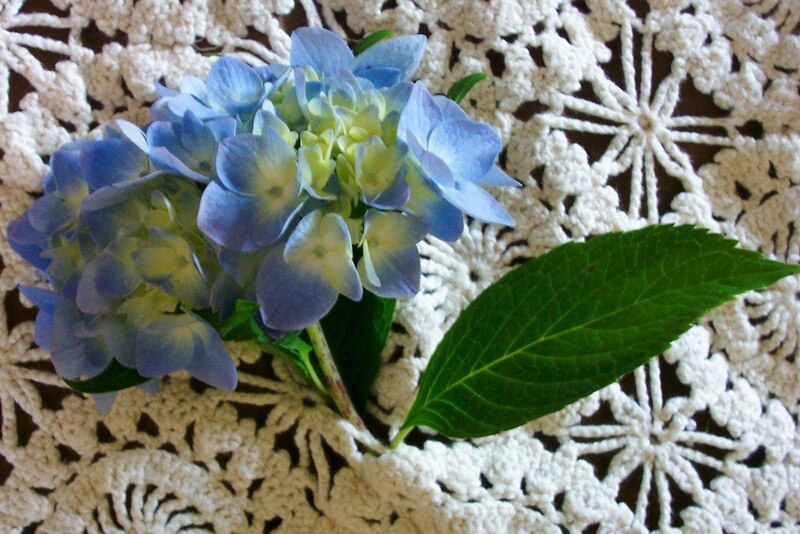 This is my photo…hydrangeas and old crocheted tablecloths always make me think Cottage. This was just to get you in the mood! See you Monday. I just did a post on Jennifer and I on my Blog.If you get a chance, stop by my Blog for a visit and say hi. I put up 3 New Posts. How sweet…that was really a nice “shout out” for Jennifer and her blog…I'll drop by for a visit when leaving here! Love the photo of that beautiful blue hydrangea on that gorgeous crocheted piece…sooo beautiful!!! My friend, I just wanted to come by to say thank you for the sweet note that you left for me on my “Celebration Giveaway”…thank you for the birthday and blog well wishes!!! I also would just like to take this time and thank you for becoming a follower of Happy To Design…I'm looking forward to getting to know you, my friend!!! Ps…wishing you the best with my book giveaway! I'll announce the winner tomorrow! I just wanted to stop by and say thank you for posting about our little Cottage8!